ESA's GOCE gravity probe launched into orbit atop a Rockot booster from Russia's Plesetsk Cosmodrome on March 17, 2009. The successful March 17 launch of the European Space Agency(ESA) GOCE Earth observation satellite aboard a Russian Rockot vehicle was alife-saving event for Eurockot Launch Services GmbH, the German-Russian companythat sells commercial?launches on the converted ICBM. 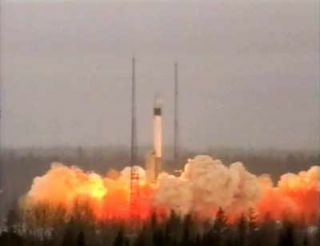 The launchfollowed the October 2005 failure of the last Eurockot mission for ESA,when a Rockotvehicle sent the Cryosat satellite into the ocean in the Arctic Circle evenas?launch teams continued to broadcast a launch success to ESA officials. Since then, a seriesof delays relating to Rockot?s Breeze upper stage and other factors had delayed the GOCEsatellite so long that mission teams feared they would be forced to changethe satellite?s orbit, a decision that would have reduced the scientificharvest. In addition, Russian inflation during the same period forced Bremen,Germany-based Eurockot to increase its prices abruptly. A mild solar cycle has permitted GOCE to remain in itsintended orbit, and?Eurockot hopes other events out of its control will help itsolidify its relations with ESA. GOCEis designed to operate in a very low orbit where the residual atmospherecreates drag on the satellite; a more intense solar cycle would have causedmore expansion of the atmosphere, increasing the drag on the satellite and thusforcing ESA to place it into a higher orbit. ?We have lost credibility in the last three years with thefailure and with the delays and the high inflation rate that has forced us toabout double our prices,? Matthias Oehn, Eurockot?s chief executive, said in aMarch 17 interview here at ESA?s Esrin Earth observation center. ?What we needmost of all now is to regain ESA?s confidence.? Eurockot is 51 percent owned by Astrium, the primecontractor for Europe?s Ariane 5 rocket, and 49 percent by Khrunichev StateResearch and Production Space Center of Moscow, which converts Rockot, based onthe SS-19 ballistic missile, into a space-launch vehicle and manufactures theBreeze upper stage. Khrunichev is also prime contractor for Russia?s heavy-liftProton rocket, which uses some of the same upper-stage engines as Rockot, asdoes Russia?s Soyuz rocket. Proton and Soyuz both launch much more frequently thanRockot, and both have the strong backing from the Russian government. Theresult has been that Rockot occasionally finds itself at the bottom of thepriority list in the Russian rocket component supply chain. With Earth observation now taking an increasingly importantrole at ESA, the agency is becoming a large customer for launch vehiclestailored to place satellites weighing less than 3,000 kilograms into polar lowEarth orbit. Volker Liebig, ESA?s director of Earth observation, said ESAhas 24 Earth observation satellites it will be launching in the next 10 years,including spacecraft financed by the Eumetsat meteorological organization ofDarmstadt, Germany. ?As we have seen, one of the biggest challenges of ourprogram has been to find suitable launch vehicles,? Liebig said here March 16.?This remains a real concern for us.? Some of these satellites, including the Meteosat ThirdGeneration satellites, are beyond Rockot?s weight and orbit range. But manyothers are around the 1,500-kilogram, 700-kilometer polar Earth orbitspecifications that are Rockot?s core business. Rockot?s immediate challenge is to regain the confidence ofESA?s Earth observation directorate before ESA?s Vega rocket ? a direct Rockotcompetitor ? enters service in 2010. Eurockot is scheduled to launch ESA?s Soil Moisture andOcean Salinity, or SMOS, satellite late this year. Oehm said the company ishopeful that a glitch-free launch will persuade ESA to retain Rockot at least as a Vega backup in the coming years. Another possible Eurockot advantage is that it may be ableto reduce its prices given the slide in the value of the Russian ruble againstthe euro and the U.S. dollar in recent months. Khrunichev recently has cutProton prices for launching commercial telecommunications satellites because ofthe ruble?s decline. Oehm said he could not speculate on whether a similar pricecut would be possible for Rockot launches.